This 4*P Coma Morphology Campaign is nearly identical to what we carried out for Comet ISON (C/2012 S1) and is aimed at achieving science objectives facilitated by multi-longitudinal observations during the upcoming close approaches of comets 41P/Tuttle-Giacobini-Kresak (hereafter 41P/TGK) and 45P/Honda-Mrkos-Pajdusakova (hereafter 45P/HMP) in 2017 and comet 46P/Wirtanen in 2018. 46P/Wirtanen UPDATES: Here, we will publish recent updates related to comet 46P/Wirtanen. Update #3 (Sep 21, 2018): We have encouraging results about the Semrock 387 nm filter. Campaign member Jorma Ryske has used Semrock 387 nm filter to image CN features in comet 21P/Giacobini-Zinner (magnitude ~7). As the CN production rate in 46P/Wirtanen is expected to be comparable to 21P/G-Z, we are optimistic about the Semrock 387 nm filter's ability to image CN features in 46P/Wirtanen and we have updated the cautionary note at the bottom of this page. Also, please refer to the comparsion between Jorma's images and Lowell Observatory HB filter images as well as the discussion at http://wirtanen.astro.umd.edu/46P/CN_filter_test.shtml#Jorma_update to find out more about this. Co-organizer Tony Farnham states: This is a promising result for comet Wirtanen, which is predicted to have a CN production rate similar to that of 21P/G-Z. For campaign members that have larger telescopes and blue-sensitve CCDs, we expect that the Semrock CN filter could be a valuable asset for following the CN coma morphology. And for the risk-takers that have a little extra cash and lots of observing time, even telescopes as small as 8-inches could use longer co-adds to build up enough signal to provide useful measurements. Update #2 (Sep 17, 2018): We have calulated the non-sidereal rates of comet 46P/Wirtanen (i.e., drfit rates/proper motion rates of the comet if you track at the sidereal rate) and how long one could expose the comet before it trails one arcsec. We suggest for those who are tracking the comet at sidereal rate to limit their expsoure times to one-arcsec-drift limited values (please click here to find a plot showing the non-sidereal rates of 46P as a function of UT time, click here to find a plot showing one-arcsec limited exposure times as a function of UT time, and click here to access the corresponding table). Limiting your exposure time to these suggested times will avoid trailing of the comet. Please note that during the perigee in December 2018, this drift-limited exposure time is about six seconds! Multiple drift-limited images taken consecutively could be stacked to increase signal-to-noise. When stacking the images, the optocenter of the comet in all images should be aligned. Also, the individual images in the stack should not be separated by more than 30 minutes in order not to smear out any rotationally induced morphological changes. Update #1 (Aug 22, 2018): Our dropbox login credentials for registered contributors changed recently and we sent out the new login credentials during the last two weeks. If you are a registered contributor and did not receive the new login credentials, please contact us at 41P45P46P [at] psi.edu and let us know. 1. What kind of images do we need? Continuum (dust) images as well as gas (e.g., CN) images with good signal-to-noise (but with an unsaturated opto-center) are desired when the comet will be highly active (< 1.5AU from the Sun). The best times to obtain images from Earth based telescopes will be approximately from mid-February through mid-March 2017 (for comet 45P/HMP) and end-January through end-July 2017 (for comet 41P/TGK) with observations focussed around respective closest approaches. [We will specify the desired time intervals for 46P/Wirtanen in 2018.]. There is no need for absolute flux-calibrated images for morphology studies, but we do encourage calibrations for those that are able, as calibrated data can be used in other studies. If the basic image reductions (e.g., bias subtraction, flat fielding) can be carried out by the observer, that will be appreciated. Even if no flat fields were taken, still your images may be of help. Ideally, the comet should be guided non-sidereally and at the comet’s rate of motion. When, non-sidereal guiding is not feasible, co-adding a number of un-trailed short exposures of the comet taken close in time could yield a good signal-to-noise image. You may submit both raw images, flat fields, dark frames etc as well as the reduced images. BUT PLEASE DO NOT PERFORM ANY IMAGE ENHANCEMENTS. 2. What do you gain? 3. What can we learn from temporally well-sampled images showing coma morphology? The science we can extract includes the rotational state of the nucleus, characterization of the nucleus’ activity, characterization of outbursts, gas and dust properties in the coma (e.g., outflow velocities), chemical origin of gas species in the coma, and temporal behavior of the tail structure. 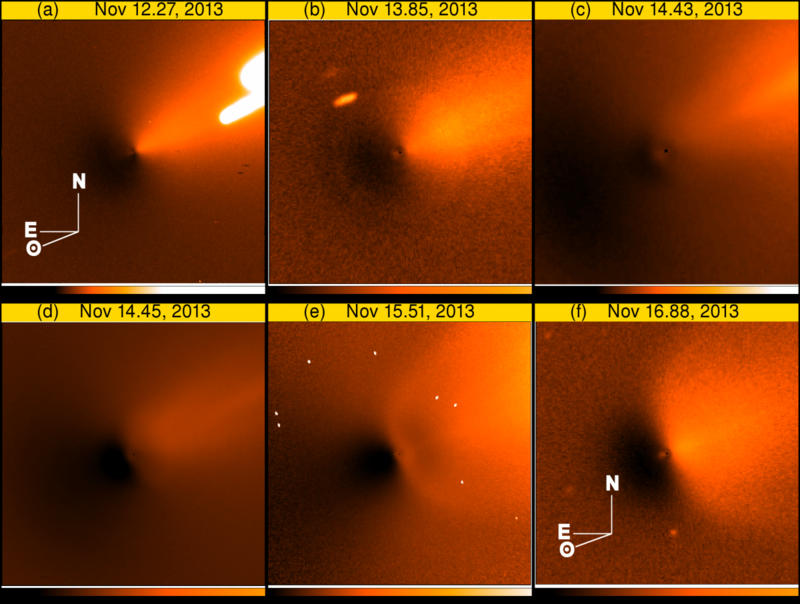 As an example, a series of enhanced images (i.e., processed images that highlight low-contrast coma features) of comet ISON (C/2012 S1) in continuum is shown on the left highligting the evolution of coma morphology due to the November 12, 2013 outburst. These were taken by both professional and amateur astronomers spread around the globe as part of the Coma Morphology Campaign for Comet ISON. A temporally well-sampled set of images was crucial for the characterization of this outburst. The red color denotes the brighter features.This figure is from Samarasinha et al. 2015, Planetary and Space Science, 118, 127-137. 4. Why do we need an international campaign of coma images? For most of the time when a comet is close to the Earth and easily studied, we expect the comet to be highly active and likely to have a coma with embedded structures. However, it cannot be continously monitored from a given location thus missing crucial time-dependent phenomena. An international campaign observing the comet from around the globe, would allow better temporal coverage, allowing 24/7 observations of the comet across all longitudes. 5. Have there been any successful global comet campaigns in the past? There were many past global collaborations. Coordinated global campaigns yielded important science and/or mission support for space missions (e.g., International Halley Watch, Deep Impact, EPOXI, and Rosetta observing campaigns provided detailed measurements for comets 1P/Halley, 9P/Tempel 1, 103P/Hartley 2, and 67P/Churyumov-Gerasimenko, respectively) in addition to the comet ISON campaigns and the comet Siding Spring campaigns. For example, from the Hartley 2 continuum images from around the world, one could determine the behavior of morphological evolution as a function of time which is otherwise not possible (or difficult) to obtain from a single observatory (Samarasinha et al. 2012; DPS meeting abstract and publication in preparation). 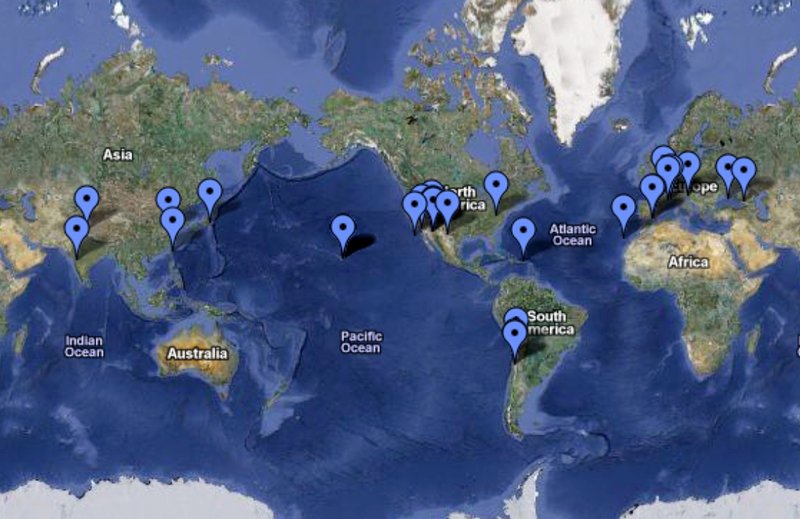 The geographical distribution of contributors to the EPOXI observing campaign led by Karen Meech is shown on the left. The observations provided excellent temporal coverage for the comet, especially around the flyby of the spacecraft. This figure is from Meech et al., 2011, ApJL, 734, L1 and is reproduced by permission of the AAS. Listed below are useful guidelines and not strict requirements . It will be ideal if all these guidelines are satisfied but images satisfying the majority of the guidelines could still be of use. 1. We are concentrating on images taken during the time frames specified earlier. However, images from other times are useful too. 2. We are looking for good signal-to-noise CCD images of the head of the comet taken with professional or amateur-accessible telescopes. If your system can track the comet well without trailing, that will be ideal. Otherwise, you may be able to increase signal-to-noise by co-adding multiple images of short exposures, where the comet is trailed less than the seeing disk (co-adding should be carried out to compensate for comet motion so the comet will not be trailed). We would like to have the co-added image(s) as well as the individual images used for co-adding (if the latter are available). 3. Any number of images from a given site on any given night will help this project (i.e., there is no set minimum number of images but at least two images from a given site on a given night are desirable). 4. We are aiming at images showing the continuum signature or specific gas species (note latter requires comparatively larger telescopes). Even images taken without a filter could be useful. We especially like images taken with the following filters: R, V, clear or no filter, CN filter (please see below for a "CN filter" from Semrock, in case you do not have HB or ESA narrowband filters). Generally, images need to be enhanced to identify the coma structure and we will carry out that task. 5. We are concentrating on the near-nucleus coma and therefore a field-of-view of about 10 arcmin X 10 arcmin should be sufficient. A somewhat smaller or a larger field-of-view (say one which differs by a factor two or three) is ok.
6. While better seeing is desirable, even images having about 3 arcsec seeing could be useful provided that those images have good signal-to-noise. 7. Ideally the pixel scale should be smaller than the seeing. 8. Images with unsaturated center pixels (opto-centers) are preferred. Saturated images could be useful under certain circumstances, especially if a saturated image is accompanied by a shorter exposure unsaturated image (to provide a comparison and fill in the saturated portions). 9. Ideally we would like the images to be in the FITS format. 10. Ideally images should have north and east oriented such that they are parallel to either X or Y axes of the images (e.g., north up and east left). 11. We need unenhanced images; however, they should be bias subtracted and flat-fielded (and if necessary, dark corrected). Absolute flux calibrations using standard stars are not required but if you have standard star fields you may submit them too. If your images are of sufficient quality (e.g., good signal-to-noise) to be used in our analysis, we will recognize your efforts by you being a co-author of any resultant publications. The success of this campaign will depend on multiple images taken from different sites throughout the world and we appreciate your efforts. We will setup a password protected drop box for uploading your images at the Planetary Science Institute (we will provide your unique login information). We will set this up once you provide the relevant information using the query form at https://goo.gl/forms/tPq28Fj77F6UPft02 or at https://docs.google.com/forms/d/e/1FAIpQLSe5lqkpaD_JgdI7cnPZyGQ9GF1aCPgZwCxP0jBETCZw-ac0EA/viewform and for any additional questions you may have, please contact us at 41P45P46P [at] psi.edu with your name (affiliation if any), and observing location, and one of us will contact you. Even if you have contributed to the ISON Coma Morphology Campaign in 2013, please fill out the query form. Click this link to obtain the observing circumstances and "up times" for different latitudes for comets 41P/TGK, 45P/HMP, and 46P/Wirtanen. Especially regarding the magnitude estimates, we like to refer to Seiichi Yoshida's website, http://www.aerith.net . We have had inquiries about narrowband comet filters for monitoring the comets. Although, not made specifically for observing comets, the specifications for some commercial filters seem to match cometray emissions. For example, the Semrock filter listed at http://www.semrock.com/FilterDetails.aspx?id=FF01-387/11-25 could be used to monitor CN emission (we thank J. Adassuriya for pointing this out). The FWHM of this filter is about twice that of the corresponding HB comet filter. We would like you to be aware of the results, conclusions, and caveats based on the tests carried out at the University of Maryland Observatory available at http://wirtanen.astro.umd.edu/46P/CN_filter_test.shtml . However, more recently, images of comet 21P/G-Z taken by Jorma Ryske are extemely encouraging and afterall this Semrock filter could be used to image CN features in comet 46P/Wirtanen. Please see bottom of the above page or http://wirtanen.astro.umd.edu/46P/CN_filter_test.shtml#Jorma_update for details.